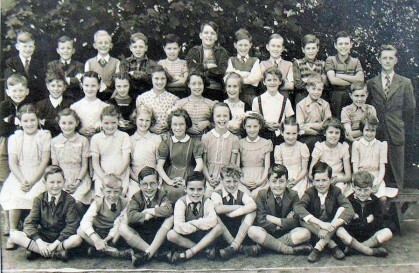 Lanehead School 1953 with Headmaster Kenneth Happer - I am back row 3rd from right. This was taken at St Cuthberts (Church Hall, St Cuthbert St/Sharp St) where we were temporarily housed during Lanehead School renovations. Back row, from left: ?, ? , ?, ?, Geoffrey Butterfield, Ronnie Duerden, ?, me, ?, ? Seated: Christine Gorton, Margaret Reid, Merle Wilkinson, Carol Williams, Valerie Catlow, Jean Hamer, ?, Anita Scott, ?, ? Cross-legged: Clive Cosgrave, ?, Clifford Canty, Alan Bradfield, ?, ?, ?, ?